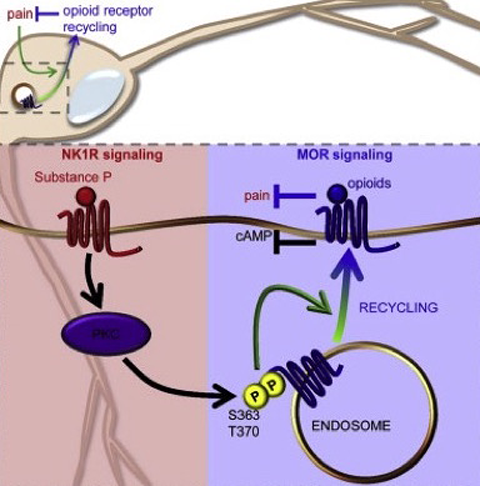 Stimulation of the inflammatory pain-associated neurokinin 1 receptor (NK1R) pathway by substance P alters the phosphorylation state of the mu-opioid receptor (MOR), reports a new study published March 24 in Cell Reports. Researchers led by Manojkumar Puthenveedu, Carnegie Mellon University, Pittsburgh, US, used live cell and fluorescence imaging of cultured trigeminal ganglion neurons to show that this crosstalk between pain and opioid analgesia increased the rate at which opioid receptors were delivered back to the cell surface, thereby enhancing the cell’s re-sensitization to opioid signaling. The researchers also showed that substance P regulated re-sensitization of MOR-mediated analgesia in mice during a warm water tail-withdrawal assay. While the clinical implications of the new study are unclear, the findings strongly suggest that “if we can actually target or accelerate endosomal recycling of opiate receptors … then we might be able to restore responsiveness at the receptor more effectively and overcome tolerance, one of the big problems of opiate therapeutics,” said Macdonald Christie, University of Sydney, Australia, who studies opioid receptor pharmacology but was not involved with the current study. “[T]his manuscript provides an elegant mechanism that intersects inflammatory pain and a long-standing target for alleviating it,” wrote Nathaniel Jeske, University of Texas Health Science Center at San Antonio, US, in a comment to PRF (see below). Many different opioid agonists have been derived from morphine, and they all have the same problems, Puthenveedu said. If they are effective against pain, generally they also cause tolerance and dependence, he explained. It has been difficult to separate out these adverse effects from the beneficial impact on pain, he continued, partly because efforts have largely focused on modifying the agonist itself in order to change the signaling behavior of the receptor. “This is a different way of thinking about it,” Puthenveedu told PRF. “Maybe we can change the events that happen after the receptor binds the agonist ... to considerably affect the physiological response to opioids,” he said. Once activated by a ligand, MORs at the cell surface are internalized by endocytotic mechanisms, resulting in loss of sensitivity to further extracellular signals. For cellular re-sensitization, the receptors must be recycled back to the cell surface via post-endocytotic mechanisms. Although the signaling pathways responsible for receptor internalization are fairly well known, the mechanisms underlying recycling are less clear (Williams et al., 2013). Puthenveedu and his team wondered about the downstream cellular effects of activating pain signaling and how a neuron’s response or sensitivity to an opioid signal may be altered by crosstalk between pain and analgesia. To begin to address those issues, co-first authors Shanna Bowman and Amanda Soohoo used two fluorescence tracking assays to examine the movement of MORs from the plasma membrane to the inside of the cell, and then back to the cell surface, in the presence of pain signals. In the first assay, MOR recycling was quantified in cultured trigeminal ganglion neurons. Results indicated that cell surface and total cellular MOR fluorescence levels were strongly correlated. But this correlation decreased after receptor internalization was induced using the MOR agonist DAMGO, consistent with MOR endocytosis. Activation of NK1R by substance P released onto nociceptive neurons promotes inflammatory and neuropathic pain (De Felipe et al., 1998; Teodoro et al., 2013). When the researchers added substance P during a DAMGO washout (which induces receptor recycling), the correlation between cell surface and total MORs increased, suggesting an increase in surface MORs. A similar increase in MOR recycling occurred when the opioid fentanyl, but not morphine, was used; the fact that this effect on recycling was observed only with fentanyl could partly explain why two opioid agonists can have different impacts, said Puthenveedu. A second assay provided “a very elegant demonstration of the reinsertion of the MOR receptors” at the cell membrane, said Christie. In order to visualize MOR trafficking at the level of individual recycling events, the researchers fluorescently tagged the extracellular side of the MOR and expressed the receptor in human embryonic kidney (HEK293) cells. Consistent with the findings observed in the cultured trigeminal ganglion neurons, administration of substance P following DAMGO increased the post-endocytic recycling of MOR in HEK293 cells, but only in cells that expressed exogenous NK1R (unlike trigeminal ganglion neurons, HEK293 cells do not express noticeable amounts of endogenous NK1R). Puthenveedu and colleagues then turned to the signaling cascade responsible for regulation of MOR recycling by substance P. Consistent with previous work showing that NK1R interacts with a G protein to activate protein kinase C (PKC; Macdonald et al., 1996; Déry et al., 2001), the PKC inhibitor chelerythrine abolished the substance P-induced increase in MOR recycling in cultured trigeminal ganglion neurons. Conversely, pharmacological activation of PKC increased MOR recycling. Together, the results suggested that the activation of the kinase is both necessary and sufficient for receptor recycling to the cell surface. The researchers then pinpointed the target of PKC, finding that phosphorylation by the kinase at two sites, serine 363 and threonine 370, on the C-terminus of the MOR itself was required for substance P-mediated regulation of MOR recycling. In a final set of experiments, the researchers examined whether substance P could regulate the re-sensitization of MOR-mediated analgesia in mice. Fentanyl increased the animals’ withdrawal latency in a warm-water tail withdrawal assay, but administration of a second dose 2.5 hours later attenuated the antinociceptive response by 40 percent, indicative of acute tolerance. Injection of substance P prior to the re-challenge eliminated this attenuation, suggesting that the substance P signaling pathway inhibits acute tolerance to fentanyl. In line with the group’s cellular data, morphine re-challenge after substance P injection did not produce a similar effect. The congruency between the in vitro and in vivo findings strengthens the link among pro-nociceptive signaling via NK1R, increased MOR recycling, and decreased tolerance, although the authors acknowledge that whether the reduction in tolerance observed in vivo is ultimately due to the action of PKC on the MOR is unclear. Christie agreed, noting that the threonine 370 site can also be phosphorylated by G protein-coupled receptor kinases (GRKs; Doll et al., 2012). “But at least [the in vivo findings] are consistent with their [cellular] data,” he added. Cell-Autonomous Regulation of Mu-Opioid Receptor Recycling by Substance P.
Cell Rep. 2015 Mar 24; 10(11):1925-36. In this interesting paper, the authors experimentally identify a model by which post-endocytic recycling of the mu-opioid receptor (MOR) can be controlled through post-translational modifications by protein kinase C (PKC) following exposure to an inflammatory pain stimulus. In this specific case, the authors identified a pathway involving the substance P/neurokinin 1 receptor/G-alphaq/11/PKC signaling corridor as contributory toward increasing MOR expression on the plasma membrane. This pathway, while novel in this set of studies, is in agreement with another set of experiments that demonstrate an upregulation in peripheral neuronal MOR activity following PKC activation (Berg et al., 2007). However, this work extends previous observations by identifying potential sites on the C-terminus of MOR that undergo phosphorylation by PKC, namely, serine 363 and threonine 370. Importantly, these amino acid sites lie adjacent to a recycling sequence in the C-terminus of MOR, such that dynamic modifications to either one or both sites could rapidly modulate MOR movement to the plasma membrane. This manuscript provides an elegant mechanism that intersects inflammatory pain and a long-standing target for alleviating it. The authors engineered a smart approach to tracking and differentiating recycled MOR from other species of the receptor. First, trigeminal neurons were nucleofected to express exogenous FLAG-tagged MOR, and were initially labeled with a fluorescent Alexa 488-conjugated FLAG antibody to detect plasma membrane receptors only. Then, MOR would be activated with a specific agonist, such as DAMGO, to induce receptor internalization and then rinsed to allow for recycling to occur. During this rinse, substance P or other agents capable of activating/inhibiting PKC would be added, and cells would again be labeled with an anti-FLAG antibody, although at this point the antibody would be conjugated to Alexa 588. Thereby, the authors could quantitate recycled MORs ratiometrically by calculating the differential percentage between Alexa 488 and Alexa 588 staining. This method was used extensively throughout the manuscript to identify recycled MOR from new MOR, providing a quantifiable fluorescent assay to measure receptor recycling. The authors also coupled functional analyses to their fluorescent work to verify their imaging results. Namely, they performed cAMP accumulation assays and voltage-sensitive dye measurements to track functional receptor changes following a similar substance P treatment protocol as they did for differential fluorescent tagging. Importantly, the authors also performed tail immersion assays to provide a behavioral correlate to their work. Although behavioral results supported the fluorescent imaging studies, the overall study could have been improved if the authors employed a behavioral measure of tissues innervated by trigeminal neurons employed for fluorescent studies. It is expected that peripheral neuronal biochemistry should remain similar between neurons of the trigeminal and dorsal root ganglia. However, attempts to match up innervating neurons with behaviorally monitored tissues should be made whenever possible for single-cell analyses. This oversight does little to reduce the enthusiasm for this study, as the results herein should provide a springboard for future work on inflammatory pain pathways that mediate analgesic functions in peripheral neurons. Regulation of μ-Opioid Receptors: Desensitization, Phosphorylation, Internalization, and Tolerance. Peripheral substance P and neurokinin-1 receptors have a role in inflammatory and neuropathic orofacial pain models.